Which fruit according to you is the prettiest? My answer will be not one but two and they are strawberries and cherries! What if they are on your nails? I shall eat them *laughs*! 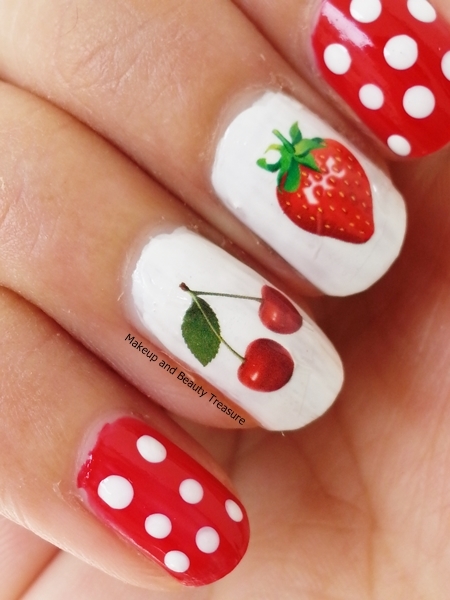 Today I am going to show you the most adorable nail art water decals that have strawberries and cherries over them! Make sure you only flaunt them and refrain yourself from bringing your mouth near the nails! You can get 10% off on your orders by using the coupon code MEGW10! If you remember I did a fruity nail art a while ago! This time I chose the pattern #036 that has yummy strawberries and cherries on it! 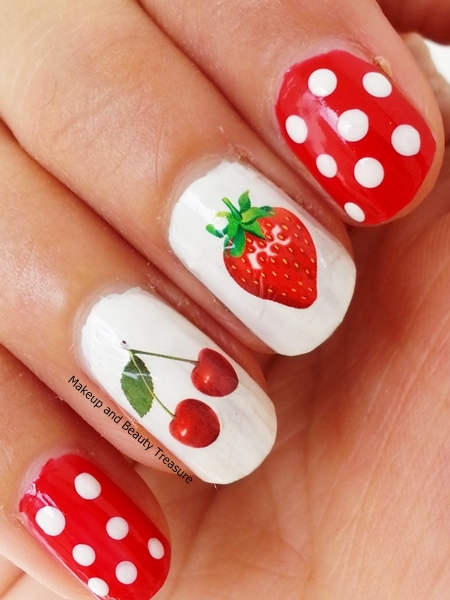 If you love red or these yummy fruits then you will sporting them on your nails! The nail art water decals comes neatly packed in a clear plastic case with all the instructions written at the back! They are very thin decals that adheres really well on your nails without sticking to itself. It feels so light on the nails that it gives me the feeling of something drawn on my nails! I totally loved the strawberries in them! The only thing I do not like about these water decals are they do not peel out in shape and I need to trim them with scissors but as they are so pretty, I really could not hate them! Always make sure to apply top coat because once your nails get in contact with water, the decals would start sliding off. Nail art water decal is one of the easiest ways to do your manicure within few minutes. I find these decals much better than nail art stickers. The pattern looks really cute and girlie on nails. They look prettier in person than in pictures. The water decals last on my nails for a week without wearing off. They can be easily removed using a good nail polish remover. These would look great on both dark and light nail polishes. I have used them on Faces Nail Splash in White O White! On my index and pinky fingers, I have used Konad Scented Nail Polish in Lychee! I absolutely love all the water decals I ordered from Born pretty Store and these yummy fruity nail art decals are the gorgeous decals that make my nails look pretty and yummy at the same time! They are of good quality and I would highly recommend them to everyone! 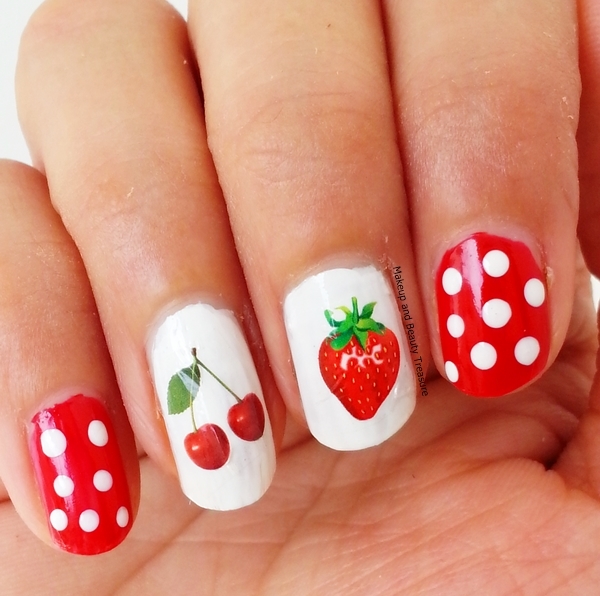 Do you love fruity nail arts?